This mighty and distinct massif is appropriately named Castle Mountain for the unique castle like peaks. It is a major landmark on the highway through Banff National Park at the junction road to Radium, BC. 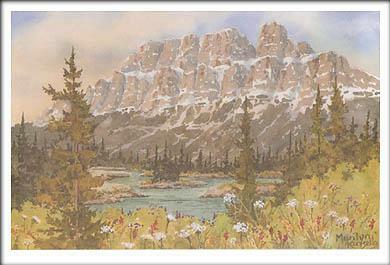 The mighty Bow River flowing quickly past, adorned with riverbanks of wild flowers creates an arresting scene...captured in this reproduction of a watercolor painting.